We sell online clearance dinnerware and giftware from our outlet store in Antioch, IL. Please click here to view sale items. Please view our Shipping Policy by clicking here. See the map to the factory outlet store at the bottom of this page. You can call ahead to check on the availability of our products before visiting the store. All sales are final. We regret that we cannot permit any exchanges or refunds on any items. All items sold through the factory outlet store are slightly imperfect, with the exception of limited edition plates. Items in plain undecorated and decorated dinnerware are sold on an individual basis. If we are out of stock on a particular item, it generally will become available again later. For the best savings, purchase decorated dinnerware in sets of 20, 40 or 60 pieces. Additional pieces may be purchased individually along with the set if available at the time of sale. We cannot guarantee that individual pieces will be available to fill in a set at a later date. 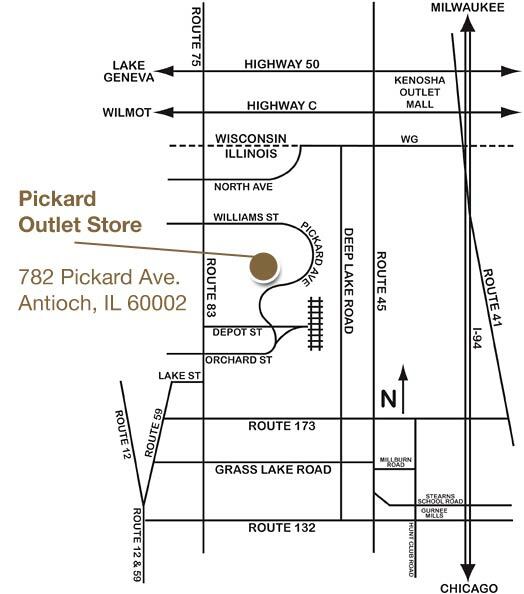 About the Pickard Factory Outlet Store The Pickard Factory Outlet Store is a true outlet store right on the factory premises where high quality seconds and closeout products are offered at 40%-60% of the retail value - not at prices that are marked up so they can be marked down like in the outlet malls. With prices starting as low as $7.25, this just could be the kind of place you'll want to shop when an elegant gift of fine china would be the perfect thing! China dealers say that Pickard's seconds are as "flawless" as most manufacturers' first quality selections. No other china has a finish as brilliant as Pickard's - it's our trademark! All the Pickard dinnerware patterns you've seen in upscale department and specialty stores are available here, plus many patterns the stores just don't have room to show. We also have some patterns made especially for the outlet store that are not sold anywhere else. Many items made exclusively for the outlet store, such as coffee mugs, candlesticks, vases and bowls of all shapes and sizes. Decorative plates feature numerous themes, as well as fine art reproductions with everything from automobiles to wildlife. Gifts for all occasions and numerous items decorated for every holiday. Inexpensive undecorated china that customers love for everyday use and microwave cooking. Every month we feature a different group of undecorated pieces at special sale prices. Plate frames, stands and hangers to display your china, along with plate savers to protect and store it. Gift boxes are also available. Sample Outlet Store Dinnerware Patterns Click on image to view a larger image. Pickard Antique Museum Items in the museum are for display only and are not for sale. Undecorated china is available in a variety of different shapes. Each month we feature a different group of undecorated pieces at special sale prices.